This is part one of a ten-part series on proposal writing. Make sure you sign up for the newsletter so you don’t miss any lessons. Over the next ten weeks, I will look at different parts of proposal development, such as writing techniques, responding to requirements, formatting, team reviews, proofreading, making presentations, applying to government agencies, and different tactics to increase your win rate. 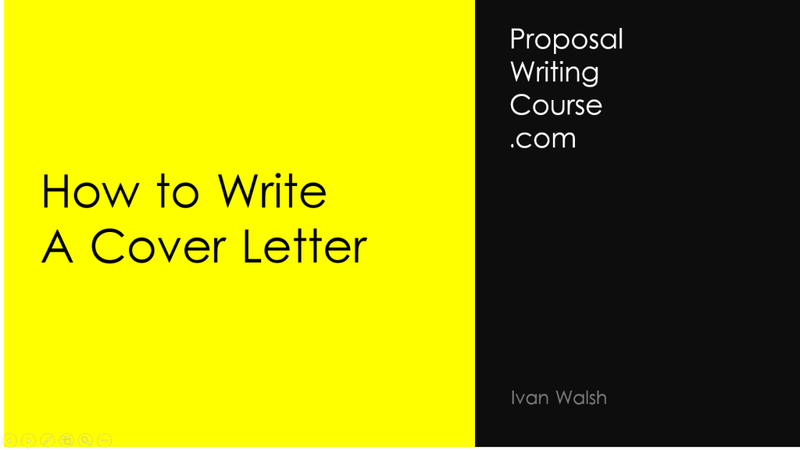 Proposal Writing – What is a Cover Letter? Let’s start with cover letters. The problem for most grant proposal writers is that we rarely write cover letters. It’s one of those documents you hear about but don’t see very often. Let’s say you decide to write a proposal. You download the Request For Proposal, look at the requirements, create a team to write up each section and finish it after a few reviews. Then you print it, check the binding, and make sure all the documentation is in place. Finally, you write a cover letter introducing your bid to the agency that’s awarding the bid. In this letter, you need to ‘cover’ certain key points… but also write it in such a way that the evaluators are impressed with your letter and look forward to reading the bid. I know it sounds obvious but proposal evaluators are human (just like you and me!) and enjoy their work more when the document in front of them has a little bit of personality. …without going over the top, of course. Just to be clear, the Cover Letter or Letter of Transmittal is the same thing. We all know that first impressions count. Well this one page document is the first thing the organization sees from you – so you want it to be right! The Cover Letter is like a mini version of the Executive Summary. But there are a few differences. Not everyone agrees but… I recommend you write the cover letter AFTER you’ve finished the proposal. So, once you have the Executive Summary in front of you, it’s easy to refine the text and develop a nice cover letter that’s not a canned response. Print on white paper – avoid flowery or ‘zany’ paper colors. Remember that your cover letter is likely to be read by the entire Request For Proposal team. For this reason, make it inclusive and encourage others to read the bid document. Paragraph 1 – Introduce your firm (briefly). Include the RFP details, e.g. name, solicitation number, and other information. Paragraph 2 – Explain why you understand the issues they’re trying to solve. Avoid clichés and jargon. Write in a confident, natural style. Highlight the three main ‘pain points’ and summarize how you’ll tackle these. Paragraph 3 – Highlight why your team can solve this problem. Give brief examples of other projects, clients, or solutions you implemented. Keep it short but relevant. Conclusion – Thank the reader for their time and then encourage them to start reading the document. Include some subtle call to action. Writing the cover letter is more difficult that it looks. For this reason, try to find examples that you can use as a reference point or ask colleagues to send over samples. Also, give yourself enough time to write, proof read, and print it. There’s ink in the printer, right? Allow for things to go wrong if this is your first bid because they will. PS: If you’re sending a hard copy of the cover letter, put it in a nice envelope. Not the standard office type but one that feels expensive. It’s a small detail but leaves a nice impression.